Game week 35 concluded last night with another drab Sam Allardyce-hosted game to avoid the drop (he’s OK but how was this guy England Manager anyway?). One nil due to a Walcott goal. Shame he couldn’t do this in GW 31 when many of us brought him in. Newcastle are safe now, of course, but one suspects they’ll not hit the beach too hard with Benitez behind them. Rafa’s clearly quality, not from the same school as Pards. GW 35 looks to have been a key one. For those managers who didn’t retain the free hit then they suffered; those who used it prospered. Equally, those without will have gained elsewhere. But did they gain to the same degree as they lost out here? I’m not so sure. Many used it in 31 but we all captained Salah that week irrespective of playing the free hit chip so I’m not sure there was as much gain to be had. From what I can see, looking at managers’ teams in our Media Industry League, many have one chip left whether it be Triple Captain or Bench Boost. Remarkably, the leader of our league, Sean Buckley, still has both left. Which are you going to play in DGW 37 Sean? I assume BB; then TC in 38? Anticipating a massive Salah or Kane score I expect for 38? Salah would be the one to go for but will Champions League affect his prospects? Sean played his Free Hit chip in DGW 34 which is also unusual. It didn’t work out for him. 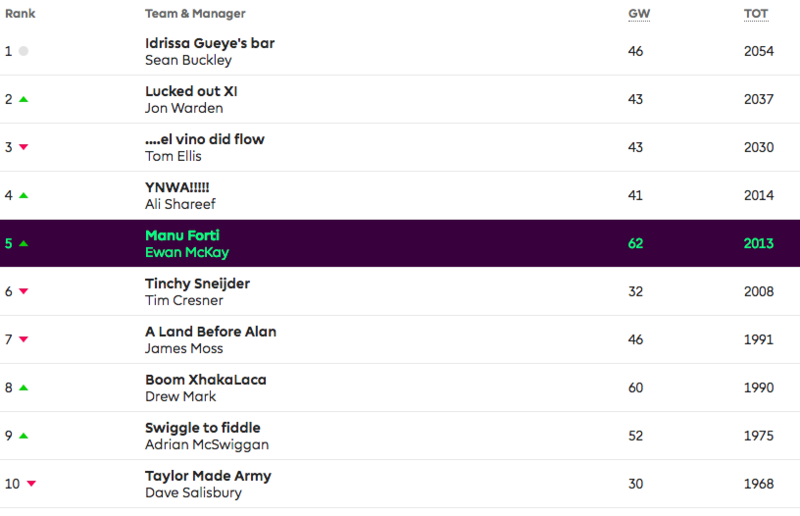 A GW rank of 3,600,000 with 20 points left on the bench meant his overall ranked doubled to 47,000 and the competition in our mini-league could catch up. If he’d played BB then he’d be much further ahead. Sean’s now only 17 points ahead of Jon Warden in second place and 24 points ahead of Tom Ellis in third. My money would still be on Sean given the chips he owns but the gap isn’t sizeable any more. With double game weeks to come, FA Cup implications, CL implications, rotation, and teams being on the beach then it’s really all to play for. Remember, there’s a prize to play for here. You too could earn yourself some vouchers or alcohol. Oh yes.